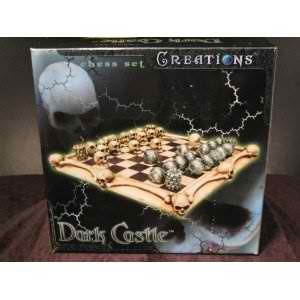 The Dark Castle Chess set features skull designs on the board and pieces. The board measures 9 3/4" x 9 3/4" from skull to skull. The playable surface is 7 1/2" x 7 1/2". The skull pieces are 1" tall. The board is a nice heavy resin material. Comes complete with board and all chess pieces. This item was discontinued years ago and we have only a few sets of this rare chess game. Sorry, but we sold out remaining sets to a chess team and it looks like we won't be able to get any more sets in.